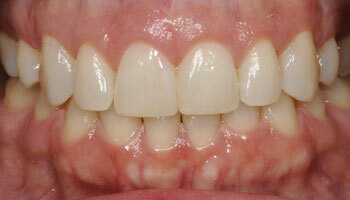 This patient's teeth had darkened over time, and he wanted a brighter, whiter smile. 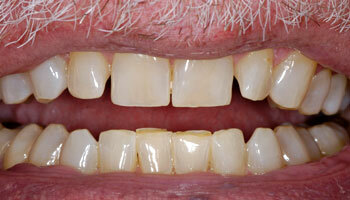 We bleached his teeth, and accomplished his goals of a more youthful appearance to his teeth. 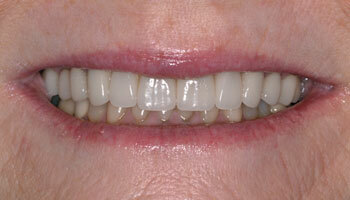 This patient was unhappy with the appearance of her teeth. 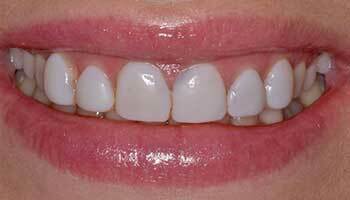 Her teeth had heavy wear, were chipped, stained and discolored. Her teeth were restored with porcelain crowns. 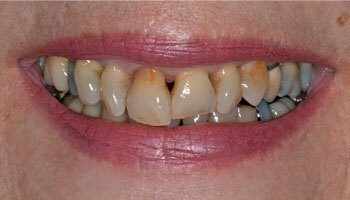 This patient was unhappy with the appearance of her old porcelain crowns that were yellow in color. Her natural teeth behind the crowns were very dark. 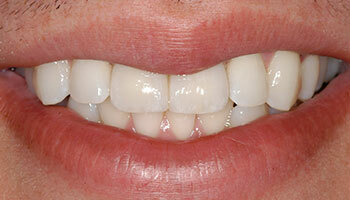 New porcelain crowns were completed to enhance the esthetics of the upper and lower teeth. 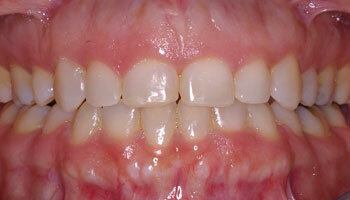 This patient present with crooked teeth and a cracked root on an upper front incisor. 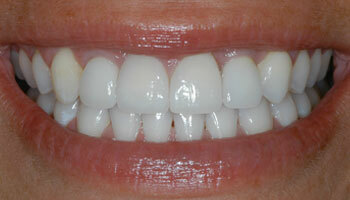 Treatment involved placement of an implant by a specialist, followed by veneers and crowns on the upper front six teeth. 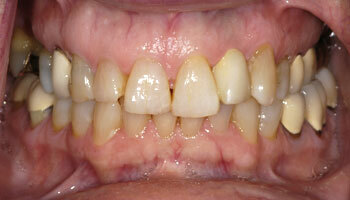 This patient was unhappy with the appearance of bonding that had been done years previously. 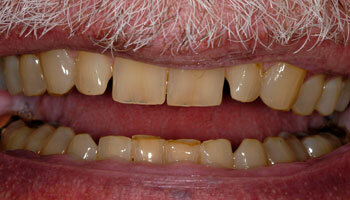 The bonding was stained, discolored and the teeth appeared misshapen. 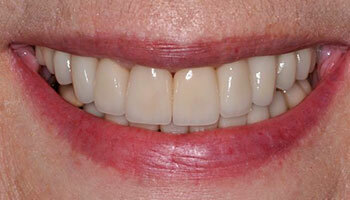 Composite veneers (bonding) were completed to improve the appearance of her smile. 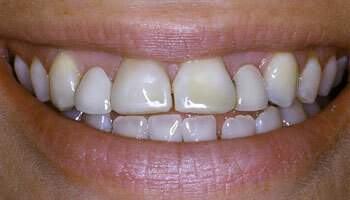 This patient was unhappy with the appearance of her short, worn upper front teeth. Treatment involved gum surgery with a periodontist to lengthen the teeth, bleaching her teeth, and then cosmetic bonding to restore worn areas. 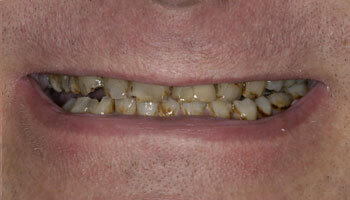 This patient had major decay in all his teeth and severe grinding issues. 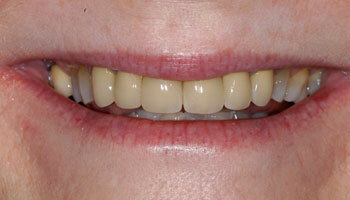 Treatment involved multiple implants and upper and lower full mouth prosthesis. 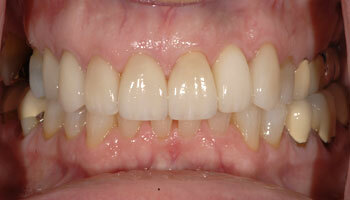 This patient was missing her upper lateral incisors, which had been restored in the past with bridges. Treatment involved orthodontics, bleaching, implant placement by an oral surgeon, veneers and implant crowns in our office. 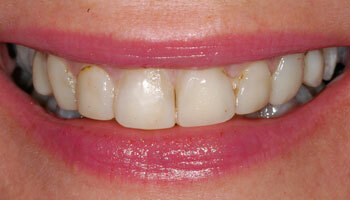 This patient was unhappy with the appearance of the bonding on her front teeth. 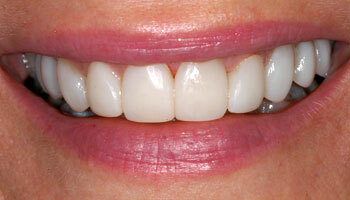 The color, size and shape of the teeth was very unnatural looking. 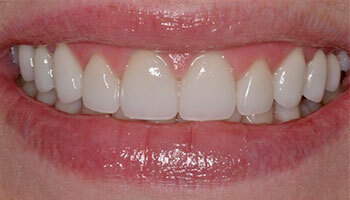 The patient’s gum tissue was raised with a laser, and porcelain veneers were completed on 10 teeth to transform her smile. 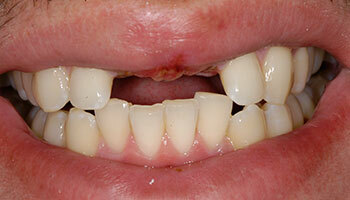 This patient was injured in an oilfield accident and lost his front teeth. 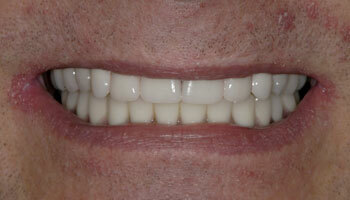 Implants were placed, the patient whitened his teeth, and porcelain crowns were made and attached to the implants.